"Coaches Corner" articles are written directly by high school coaches, providing a unique perspective on topics both on and off the court that impact the game and prep sports in general. 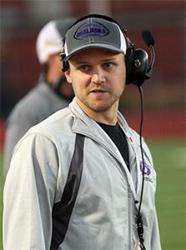 Written by Onalaska football coach Tom Yashinsky, who just finished his 7th season as head football coach at Onalaska. Previously he was an assistant under Dieter Antoni for 4 years. He also coached at UWL under Larry Terry for one season as a student coach. His first coaching job was as an assistant coach at Ben Eielson High School, Eielson Air Force Base, Alaska. When football ends in the fall I put away my coaching hat and pick up my referee shirt and whistle and take to the basketball court. Every winter I ref numerous lower level basketball games along with youth tournaments. While the six figure paychecks of coaching high school sports(I include the numbers to the right of the decimal as well) are great, I like to make a little money on the side and also stay involved in sports through the off season. It also allows me to see how other coaches coach their teams. As I ref youth basketball in the winter I realize there are some big differences in how people coach youth teams. This makes sense in that there really is no formal training, there is no experience needed, and typically it is a parent trying to give their kid a good experience. Youth coaching is a thankless job as typically you are not paid and more likely you are paying to coach as your kid is playing. My goal with this article is to give some tips to those who coach youth; on how to have a successful season, regardless of wins or losses. Always stay positive with kids. Never forget you are coaching kids. Kids are attracted to positive role models; coach them in a positive way. Encourage them every chance you get. Your goal as a youth coach is to teach them fundamentals, have a great experience, and make sure they come back the following year. Kids that quit youth sports rarely rejoin come middle and high school. Be cognizant of the words you use with them. Coach them on the things you want to see out of them, not the things you don’t want to see. Say “move your feet” not “don’t foul or don’t reach.” Think about the words you are using and anytime you catch yourself about to use a word with a negative connotation (don’t, can’t, won’t) flip that to what you want to see out of them instead. It will put positive thoughts into their minds which will result in positive actions. How many times have you heard a coach yell “don’t dribble to the corner” and right after that a kid dribbles into the corner? Coach to improve, not to win. This is a hard one for people to swallow, but prepubescent state championships do not indicate long term success of a program. You will always have a really good player, and really good players can win youth tournaments. Come high school though, really good teams beat really good players. Make sure you are developing the entire roster. Make sure you are playing the entire roster. Every kid on that team matters, even if you don’t think they will ever contribute. I had a kid who as a freshman I would have thought was never going to contribute on varsity because he just didn’t look like a kid that was going to have the ability to play varsity football. The young man stayed in the weight room for four years though and did everything he could to get better. He played scout team every time we asked and contributed on special teams every opportunity he got. He ended up blocking three punts for touchdowns as a varsity athlete. He wasn’t an every down stud for us, he didn’t have weight room numbers that jumped off the page, but he had a knack for blocking punts and finding the end zone. He never gave up on hard work, and as coaches we never gave up on him. At the youth level we need to make sure those kids make it to high school still playing sports because you never know when a growth spurt will hit or when they will fall in love with hard work. In the end we know kids value the trip to Culvers after the game more than whatever place ribbon they got from the tournament. Don’t yell at the refs. I don’t say this because I ref, I say this because of what it teaches our athletes. The best coaches that I have reffed for never complain about a call because they know in the end the calls don’t matter, it’s about getting kids better and giving them a good experience. Just like the kids, I’m out there reffing to try and get better. I’m going to make mistakes and miss calls. Usually we recognize when we miss one, the parents are quick also to help us out on those. The moment a youth coach starts yelling at the officials it lets the kids know that it's ok for them to complain about them as well. Teach kids good sportsmanship by interacting with the refs in a positive manner and not acting like they are an opponent as well. You get what you emphasize, and you get what you allow. I was recently working a lower level high school game. In the pregame one team was having a good time and playing some mini games while their coach sat on the bench and watched while talking to the other coaches. When the game started things weren’t going well and the coach called time out. The first thing he said was, “This is what happens when you spend all warm ups playing ‘Two Ball’ instead of going through our drills.” As a coach, if you let kids do something other than what you are expecting of them, that's on you, not the kids. It’s your responsibility as a coach to hold the kids to the standard you want during pregame. Don’t blame the kids for what you are allowing to happen as a coach. If you emphasize great energy, and a positive attitude, you will get that from your kids. If you emphasize complaining to refs and negative body language, you will also get that from your kids. Don’t allow what you don’t want, and emphasize what you do want. Make it fun. This is the most important part of youth sports. It needs to be fun. If that means taking some time out of practice to do something that has nothing to do with the sport you are coaching, do it! Our freshman coach every year around homecoming has a dance competition with our freshmen football team. They take the pads off, they throw some tunes on and they work on their moves for the homecoming dance. It’s fun, the kids love it, they bond as a team, and the kids remember it. Every time our freshman coach walks into the building he is the center of attention for the kids that played for him, even if they no longer play football. He made it fun and kids wanted to be at practice. It also gave him credibility in the times where practice wasn’t so fun and the hard work needed to get done. I’m not perfect as a coach by any means and my longest win streak doesn’t require the removal of shoes to count. But I do think that kids leave our program having a positive experience. My goal as a coach is to give that experience to as many kids as possible. The only way to do that is to keep them in youth sports so that they come out when they reach high school. I hope that you can take some of these tips and apply them to wherever you coach. Thank you again to WisSports for giving me a platform to share my thoughts.